Please refer to our stock # 1874 when inquiring. 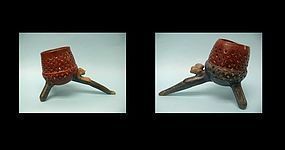 Sold Separately for $1,800 Two Aztec Pottery Ceremonial Cercers with Portrait Head & Rattle, Mexico, ca. 550 - 950 CE. Painted black & red with unglazed areas, applied stylized human head with clearly defined features on base. Open geometric pattern, Both are repaired from original pieces with restoration over the break lines. 5 1/4" high x 8 5/8 long x 4 3/4" wide. Incense burners (or censers) are a regular part of household artifact inventories at Aztec-period sites in central Mexico. People made offerings to the gods by burning copal, an aromatic resin made from the sap of various trees of the genus coparifera.